How to draw an arc. How to turn an arc into a circle. How to draw a quadratic curve. How to draw a Bezier curve. Interactive programmes to practise the role of centre and end points. In order to draw an arc, we must specify a centre, a radius, a start angle, an end angle and the direction in terms of of a Boolean value - clockwise/anticlockwise. The angles must be given in radians. 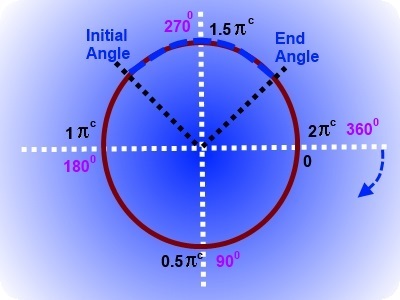 If you are not familiar with radians, you can easily convert degrees into radians by multiplying the value in degree by π/180. A quadratic curve, also known as a parabola in mathematics, can be drawn on canvas by context.quadraticCurveTo() method. First of all, context.moveTo() method must be used to specify the beginning of the curve, also known as the context point. The two arguments of context.quadraticCurveTo() method are the pair of coordinates of the centre point and end point respectively. First, read the code; then, click the interactive button to see the effect on the curve on the canvas, when the centre point is changed. A Bezier curve can be drawn on canvas by context.bezierCurveTo() method. First of all, context.moveTo() method must be used to specify the beginning of the curve, also known as the context point. The three arguments of context.bezierCurveTo() method are the sets of coordinates of two control points and the end point respectively. First, read the code; then, click the interactive button to see the effect on the curve on the canvas, when the control points are changed.